*Free Lunch will be provided. This presentation will outline the information security required for clinical systems, the current laws relating to personal data privacy and protection. It will also discuss with the participants on the steps to be taken to address the legal compliance, auditing and maintaining information security in the healthcare environment. Raymond holds a master?s degree in information management. He is a Certified Internal Auditor (CIA), Certified Management Accountant (CMA), Certified Information Systems Auditor (CISA), Certified Information Security Manager (CISM), and Certified Fraud Examiner (CFE).� Raymond currently serves as Vice President of ISACA China Hong Kong Chapter. He has been heavily involved in educating and promoting IT governance, auditing and security activities in Hong Kong and China. Prior to founding SAM, Wilson Yeung has worked for over 30 years in the IT industry, half of which being with IBM and the other half running software development business under the entity YNA, with major focus in healthcare systems. Wilson has been involved in Hong Kong Health IT projects since the first-in-city implementation of Admission/Discharge/Transfer (ADT) system in Prince Margaret Hospital (PMH) as IBM System Engineering Manager. 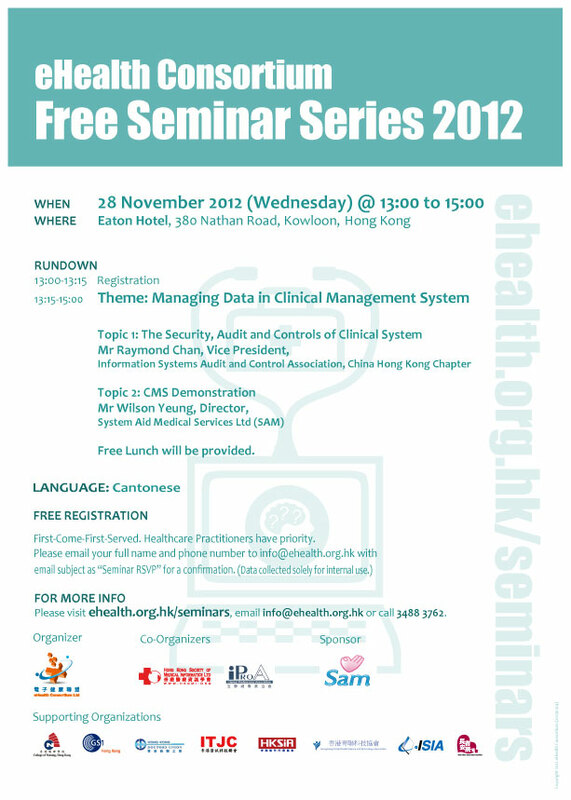 His company was the developer of the first generation Practise Management System of the largest HMO in Hong Kong. In the recent years, he has worked, in a personal capacity, at Hospital Information System (HIS) implementation projects for two private hospitals in Hong Kong and Mainland China. First-Come-First-Served. Healthcare Practitioners have priority.